For the next two weeks I will be testing the limits of distance learning. I am in a remote part of Iceland and have very limited access to technology and WiFi. So, I apologize in advance for any typographical errors (the keyboards are different here!) Naturally, I will do my best to communicate, but simply might not be in a region that will allow me any access via WiFi. This week we are reflecting on Warnock’s discussion of collaboration in virtual groups through group posts and group work (Janet Wilson) in efforts to build and develop a sense of community (Cameron et al., 2009) in our digital classrooms. 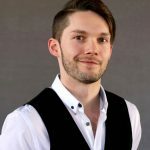 Initially, I’ve felt that I had much more success with building strong teams that near the idea of building a true sense community within the f2f format. Naturally, with 9-15 hrs of face-to-face communication time, I’m afforded many opportunities to observe non-verbal communications between groups that provide me some idea of how the group dynamics are developing. It allows me not only to observe behaviors among members of a group, but also among groups. Although, I still have this ability of observation in my hybrid classes, I’ve begun transitioning most of the the collaborative components into the online space and have been quite pleased with the results. Below are some of the ideas and tools that I’ve implemented with varying success in my efforts to build community in my digital classrooms. Google Docs / Slides / Google Groups: Janet Wilson mentions her use of these products and I’ve spoken of them at length in previous posts. Yes, I think they are great for collaborative work and building a team environment. In all my ESL classes I spend some time teaching students how to use this technology if they don’t already know how to use it. Weebly.com and Wix.com editors in which I create a teacher account that allows me to have classes and student account. One recent example where I used this for a collaborative project was as part of a character assignment for “The Great Gatsby.” Teams were assigned a category, i.e., themes, characters, symbols, quote analysis, and then were required to write a page (build a web page within the group website) on their group topic. It appears to have been a good team building activity as some of the deliverables were amazing to see. WikiStory: The idea here is simply to use a Wiki for a collaborative project. A friend suggested this to me who was doing a 3-word story assignment where students each had to only add three words at a time to their story. My approach was a bit different; I used it to have students respond to plot lines in assigned readings and discuss potential meanings with each other. Appear.in: I have not yet used this application, but a colleague of mine likes using it so I plan to try it out in the near future. In a nutshell, no registration or download is required and it offers a free version that allows up to 4 individuals to video chat. It also has screen-sharing capabilities. If any of you have used it, please share your evaluation of it with me. Survey Monkey: I’ve used this to get group conversations started, especially if it appears to be a group not inclined to jump right in to chatting on message boards. This allows me to control the initial discussion by asking a number of questions to all students, collect their individual feedback, and then (while respecting their anonymity) share their ideas without identifying them as new questions to the group, which are then answered in a message board or chat setting. Looking forward to reading your thoughts on collaboration and the tools you love integrated into your digital classrooms. To me the biggest challenge of migrating to online teaching would have to be creating a collaborative virtual environment. In the online classes I have taught in the past, students liked the time flexibility and asynchronicity that a f2f class could not offer. This was a fact I failed to take into account when assigning my annotated bibliography group research project. I naively thought that online students would possess enough self-motivation to cooperate independently with one another, and I offered all the toys available on Blackboard, such as wiki pages, file exchange, blogs, and group discussion boards. In the end, there were not enough such students, and the toys were seldom used. In my f2f classes, this kind of big research project is assigned and groups are formed very early in the semester. The groups work together for other collaborative activities during the course, and as a result, form strong bonds. Today, so many options exist that allow for effective and meaningful collaboration in the virtual world. I have found that online collaboration often allows for much more engagement and interaction by each student than sometimes occurs in an f2f class. It is not easy to sit back and not contribute in an online group… it becomes so much more obvious and typically students will call out the non-engaged student. Interestingly, students might elect an online class because they prefer a more independent experience and don’t expect much collaboration. But in a process-based course, collaboration is going to be a key to students’ growth and success, and if set up from the beginning in our online (or on-ground) writing courses, students come to expect and enjoy the experience. Just as in the traditional classroom, we must provide clear instructions, expectations, and outcomes which will more likely result in a successful outcome for any collaborative/group experience. And just as in the f2f, our role does not end with these tasks, but we often have to model, encourage, and facilitate to ensure that meaningful collaboration and learning occurs. I think the greatest challenge could be if the technology for some reason doesn’t work on the students’ computer, phone, or pad. So, the way I would work around this is before any group type project, students will have had to utilize the different technologies that are expected in the collaborative group experience. In the group project I propose below, we are in about week 4 and students have managed to utilize the different technologies in simpler tasks that have been done on Canvas’ Discussion Board. 1) I will place students into groups of 4-5 based on previous paragraphs the students have written where they analyze a piece of advice or life lesson they have learned from someone in their life, e.g.- power of forgiveness, balancing work and play, spreading kindness, etc. If I can get the groups to have sort of a shared theme, I would go with that as they would already have a connection. 2) Using Canvas’ Discussion Board as their work-group platform, students will each select and upload a YouTube music video and write a post about what life lesson is being communicated in the song/video and why this is meaningful to them. Further they will comment on what moves are being used (lyrics, rhythms, video images, etc.) to communicate the lesson. 3) Once the videos and corresponding posts are uploaded, other members of the group will use the video feature on the Discussion Board to respond to each other’s posts, being directed to ‘communicate as if you are having a face to face conversation’ (in other words, it is video, not just audio). They will comment on the song/video, the writer’s ideas in the post, and add his or her own thoughts about the life message they perceive and other comments about how the message is communicated. The original writer will craft video responses to each member with his/her thoughts to close the loop. 4) Once this interaction has occurred, the students will be directed to write an analytical paragraph about the song, with the life lesson identified in the claim/topic sentence and then providing their evidence and analysis which they will color-code to ensure balance. This will be the fourth analytical paragraph the students have written, so they would know the drill. Students will comment on the Discussion Board post using the designed peer review worksheet provided. 5) After receiving feedback, the students will move their paragraphs to ONE shared Google Document. They will then watch an online video lesson about crafting a thesis statement and introductory paragraph. Based on the paragraphs and claims that have been submitted and using the online lesson as a guide, they will each propose an intro/thesis on the google doc in pre-set tables that would work for their collective paragraphs. They will then look at each other’s work and collaborate in writing to compose the most effective intro/paragraph, hopefully building on the initial entries, not simply picking one to use. 6) The students will watch one final video on creating 1) an MLA Works Cited entry and will each be responsible for building their own based on the YouTube video, and then 2) formatting an MLA document. 7) The final task will be to take the Google doc, format the work into a correctly formatted MLA document with Works Cited page and upload it to a new Class-wide Discussion Board Forum so all the students could see. I would then create a Camtasia video reviewing and commenting on each of the drafts. Okay, if you have any feedback and/or suggestions, I’d love to hear it. Thank you and looking forward to reading all your amazing ideas! We must see group work as a component of a group project. The two are not necessarily distinct or different in my mind. Effective group work grows into a group project. In Janette Larson’s video, she distinguishes between group work and group projects in a helpful way, but one that I think I’m gonna push against ever so slightly. 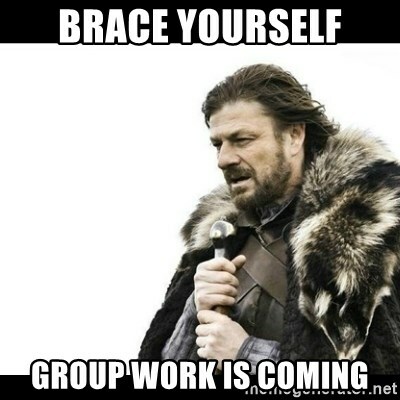 Whereas group work consists of low-stakes assignments that can be done quickly and in class, group projects are high-stakes assignments that require outside meetings and work. In my own classroom, this is largely how I have treated them up to this point, but, in OWcourses, I want to begin scaffolding major group projects through group work that adds pebbles to the bucket across the semester. Group work-projects, if you will. To help you imagine this, I want to brainstorm you through this collaborative work-project that I’ve been chomping at the bit to do: the Canonizing Climate Fiction working site. The assignment is a semester long project that results in a class-curated website on climate fiction, or literature about climate change. This course website will do three things (which correspond to three/four assignments). I want it to be populated with critical blogs and essays written by students about the novels, poems, short stories, and films that we analyze in class. I want it to act like a Wikipedia on climate fiction. I want it to have multimodal presentations that introduce readers to critical issues/keywords in climate fiction in an entertaining and educational way. I currently envision each one of these components as an assignment or series of assignments that students will perform throughout the semester both independently and collaboratively. To start, I need to cultivate student buy-in. That’s where the website fits in, at least in my mind. Rather than having an assignment that is written for me and read by me, I want to develop assignments that students recognize will be read by others, strangers, potential employers, future friends, longstanding enemies, and perhaps other scholars in the field. While these seem like high stakes, I want to make it feel more doable through lower stake assignments. Critical blogs would be my first step. These feel like the most natural assignment to migrate first, considering so many instructors already do them online. In the first few weeks, I want students generating and responding to content a lot. Similar to what we are doing here, I will ask them to respond to an open-ended prompt and then ask them to respond to a set number of people. These will be short: 1-2 pages. Furthermore, I will help students to recognize that these are the beginnings of their critical essays. Therefore, I can use this as a way to get students to start writing early and to set them on the path for revising later. Transforming these blogs into critical essays would be my next turn. In order to do this, I will divide the class into working groups based on their interest. These groups will be in charge of identifying and generating content for the website by working together to revise blog posts into more formal essays that they are used to writing/reading. I want this to be done via groups because I want students to collaborate to decide what blog posts are most successful. Rather than having me act as an editor, I want every student in the class to assume that role to some degree. Additionally, I see this as a reiterative assignment. That is, students will be asked to send their essay through multiple rounds of revision with multiple people in their group at different stages. I want to really use this as a time to highlight the repetitive process of good revision, and I really want students to have time to develop something that they are really proud of, especially since it will be publicly available (with exceptions). While working on this, I’ll also assign these groups various texts for which they will be in charge of creating Wikipedia pages. Students will either work in partners (or in triplets) on a single author or text. I will ask that they to essentially reproduce a Wikipedia page about their subject in form and content. I will task them with deciding what kind of information is most critical and how they want to organize it. At the same time, I’ll assign another two groups the job of peer reviewing their Wiki post. Much like Wikipedia, all students in the class will act as experts and will be in charge of correcting and refining their peers’ ideas. Finally, I want all of these different elements to converge with a multimodal presentation in which the different groups work together to combine their thoughts into a coherent project with a clear thesis and strong, well-analyzed support that is visually/aurally interesting. For example, if one of the groups is organized around “Race and Colonialism,” then they might discuss how a novel, a poem, and a film work together to explore how narratives of climate change can illuminate the sovereignty of indigenous communities in the United States. For here, students can combine their own ideas from their blog posts, their essays, and their Wikipedia posts into a project with even bigger stakes—projects that they would be incapable of doing independently within the same constraints. Importantly here, I would also want to introduce them to new publishing formats such as StoryMapJS or TimelineJS that can give them new ways of thinking about the assignment/their argument/organization/publication. When it comes to collaborative assignments, I think Janette hits the nail on the head. Without student buy-in and clear expectations, it won’t meet your own goals. Through these scaffolded assignments, I hope to teach students about the process of crafting, drafting, and publishing information in ways that can prepare them for future classes/careers. Additionally, I hope that these kinds of group work-projects can introduce students to collaboration in non-threatening ways. Most of these can be done independently to some degree, but to full completion. In this way, I also hope to show students that working fully independently is a myth. Good writing rarely happens in isolation, and I hope is work-project assignments can begin transforming how students think about composition more broadly. I’d actually love to hear people’s thoughts on this. I’m not gonna lie. This is a massive project. I actually kinda see it as an on-going project that last for multiple years and multiple semesters. In this way, I hope that students can recognize how collaborative work is not limited to their current semester. Rather, they are still in collaboration with students from the past and with the students who will take this class and revise upon their work. 1) How does one create the trust and working rapport necessary for successful collaboration? 2) To what extent can the writing itself be collaborative without one student taking over? 3) How do we push our students to go (in Ken Bain’s words) beyond “surface learning” (doing the minimum to say they completed the assignment) and experience “deep learning?” I guess I’m reiterating Janette’s question of how to turn the experience away from a focus on grades and towards a learning community. In my ENG 100 and HSE courses, much of the semester is devoted to different modes of rhetorical analysis (though I have become increasingly less jargon-heavy in my prompts and scaffolding). We start with the analysis of one text, next we move on to the lens assignment, then we incorporate research, and end the semester with the analysis of a visual artifact. The final unit is focused around ideas/ questions about gender identity, After analyzing 3-5 written arguments, we move into an analysis of a documentary called Miss Representation- I have students work in small groups for multiple class meetings- identifying rhetorical strategies the filmmakers use (editing, music, shot type, sequence, structure) and analyzing why they use them. This culminates in a group project where each group is assigned specific strategies to identify and analyze how these strategies work and why they’re used. Students can use PP, Google Slides or any other platform to develop a multimedia presentation for the class. The visual aspect won’t get lost – here I’m thinking I would provide a model of analysis using clips from the film with recorded commentary that students could access when needed then after being set up in groups, students could asynchronously practice their own analysis of whichever strategies they feel compelled to pay attention to, recording their findings on a Google doc, including screenshots, or links to short clips of the documentary to give examples. Group roles: One thing I need to strengthen in my f2f classes in the context of group work is careful attention to who does what. Warnock acknowledges the challenges of staying on task, and advocates for the assignment of group roles-“leader, meeting organizer, secretary, head researcher, chief editor” (149). I think an online space could end up making these roles more concrete and effective since many students might appreciate the dynamics of more clearly defined roles that need to be clearly laid out for the online context. One idea that I heard on the Teaching in Higher Ed podcast that seemed to lend itself well to an online class while addressing many of the potential issues in Warnock’s section on Team Projects was the idea of the Scrum Board. Rebecca Pope Ruark, author of Agile Faculty, promotes the idea of using a Scrum Board to help students work collaboratively and track progress. In her explanation, a Scrum Board has three separate columns-To Do, In Progress, and Completed. Once groups are underway, they could track their progress on a virtual Scum Board-this could be a Google doc or some other virtual space -I’m open to suggestions! This would be specific to each group- with smaller sections for the responsibilities of each individual group member and the corresponding tasks. I imagine this would be a good space for groups to monitor their progress and I could track who is assigned which task and how each group member is contributing. Finally, each group could come together to craft their final presentations- they may need to do a few synchronous planning sessions to develop the presentation, but they could break it up into individual components that each member could work on individually and then bring back to the group. One question I have is for the presentation itself- would we have synchronous sessions where the groups could present “live” or would we have a discussion space where students could view the presentations on their own time? I would have to work this out. Feedback: This is another area where I feel like the possibilities of technology would benefit strong feedback. I would record an asynchronous response to their presentations- giving them feedback and assessment- attending to how effectively they worked as a group.Afterwards they could assess their own work both individually and collaboratively in a discussion thread specific to their group (though I’m hoping the Scrum Board will help recursively do much of this work). I still have lots of questions and concerns about how this will translate/ transition but I am excited by the possibilities. I love that this assignment has me already thinking about the courses I teach and I can begin the process of HOW to transfer F2F collaborative work toward online interactions. Janette’s video and Warlock definitely gave me some ideas as to WHAT I can do ahead of time to have online collaborative group work feel purposeful versus a goal toward points or desired grade. Janette’s discussion on building a foundation for students to see the importance of collaborative work beyond grade and more toward: personal development and communication skills, as the more desired benefits, is a nice way to get students to think about the larger reward at hand. This is something I’ll definitely use as Janette’s methods communicate the importance of collaborative work for students who may already carry the stigmas about online course being isolated experiences. One particular assignment I give students is a photography project that then goes on exhibit for the campus. Based on the themes we’ve covered throughout the semester (English 100 or English 201) students collaboratively create a photo album of images captured in their own community that highlight the themes discussed. For example, if we read ‘Borderlands/ La Frontera’ by Gloria Anzaldua, they can create a series of photos that capture their own understanding of the tangible and nontangible borders that exist in their own lives. The second objective is for students work on a critical response, where they pull supportive evidence from the text to prove their photograph is doing that work. Once the assignments are done, we usually display the photography and responses as the event for public viewing. So the F2F assignment does two things: 1) Create photography 2) Create a space in which the photography can be viewed publicly. Some ideas on how to make this happen online is to have students possibly create an Instagram or Facebook account. They can creatively name their account and create a mission statement based on the theme they’re working with. I figured this would be cool location to exhibit their work for public display. The collaboration would not only be the creation of the account and photography, but to have different group members respond to each other’s photography using the course material. *The team can work on gaining a certain number of followers, an expected amount of photos for display, and find organizations on line who’d be interested in viewing the work their producing. *The rest of the class can also respond to a certain number of photos with course material as an additional form of engagement. *Perhaps to close out the assignment the group can write a reflective response about their project, how ‘collaboration’ came into affect, and the benefits of working together via online. So that’s as far as the brainstorming has gone, but I feel accomplished knowing there’s possibility to bring the existing projects into OWcourses.